What a crazy week! We have been super busy with reading novels and researching about spiders, along with beginning our money unit in second grade and finishing our skip counting unit in first grade. This week we broke out all of our Halloween centers and went to town! My first graders did a quick short vowel review before we started working on long vowel sounds. And my second graders worked on using commas correctly, but also identifying when they were used incorrectly. Today things were crazy as the fire safety house from our local fire station came, so we read the book Too Many Pumpkins, which is one of my favorites! One of the reasons I love this story is because the author has written it in such a way that it lends itself to many predictions. If you've ever done a DRTA (directed reading thinking activity), you would know that you could read, pause, predict, read, pause, allow time to change their prediction, and repeat. While we were doing this, when we got to the page below, one of my students said "She has a pumpkin farm!" A couple had already heard the book and knew what was going to happen, so I had to remind them to keep quiet so they wouldn't blurt out what was about to happen. We completed a couple activities working on cause/effect and problem/solution on the story. Both of these activities were free things I had from other teachers. 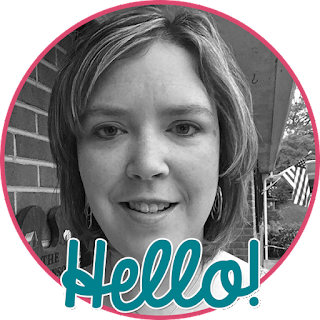 One of the activities is from Andrea Crawford, the reading specialist in my building, who blogs at This Literacy Life. She wrote a post about mentor texts to teach problem and solution. Click on her button or here to get to her page. 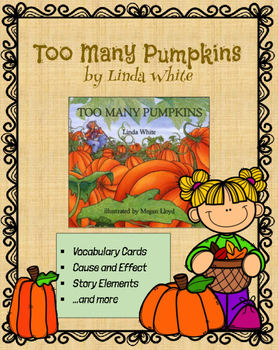 I also found this free activity on Teachers Pay Teachers that has a great activity on cause and effect using Too Many Pumpkins. We had a great visit with the fire station today! It was really windy, though! Thanks for the shout out! I love how your kids were thinking so much during the story. Love using a DRTA! Happy Halloween!